Organic Medium Grind Black Pepper lends satisfying heat and bite to most any dish. It works well in combination with other herbs and spices and is commonly found in spice blends. Black pepper's woody, floral and pungent flavor is thought to inspire the appetite. Our black pepper is carefully selected from the world's premier pepper-producing regions. 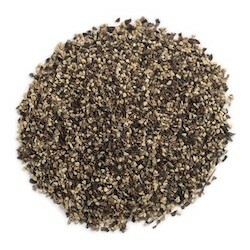 Slightly more coarse than finely ground pepper, medium-grind organic black pepper is ideal for tabletop shakers. Pepper is native to the monsoon areas of Southeast Asia. Over 13 types of black pepper are grown commercially today, primarily in India, Indonesia, Malaysia, and China. Pepper accounts for about 35 percent of the total world trade in spices today. Alive & Well's philosophy is based on us as human beings taking care of our health as well as our pets and animals by consuming whole living foods and herbs, and through the use of natural and organic products, doing regular exercise, breathing fresh air, absorbing sunshine and drinking and bathing in good clean spring water, all in the way God intended us to when He created us and the universe. On both riverbanks will grow all kinds of trees for food. Their leaves will not dry up and their fruit will not fail. There will be a different kind of fruit each month because the water flows from the sanctuary so that this fruit will be edible and the leaves will have healing properties." Ezekiel 47:12 CJB. Disclaimer: The Western Medical Field believes that God, Jesus and the Holy Spirit, the Word of God, food, herbs and frequencies have nothing to do with the health of the body. We believe that God, Jesus and the Holy Spirit, the Word of God, food, herbs and frequencies all work together to create harmony and health in the human body the way God intended it to be when He created us and the universe. Since we work with God, Jesus and the Holy Spirit, the Word of God, food, herbs and frequencies collectively, we certainly are not entering the Western Medical Field and are not practicing Western Medicine. We believe the Western Medical Field is founded on witchcraft and sorcery and therefore separate ourselves from them and will not recommend drugs or their practices and will not replace the prescriber of drugs or their practices.